Fascinating excerpt from a great video previously posted. This entry was posted in #HRDPAR, Special Effects on July 29, 2017 by ab. I think I looked too quick. Thanks to Xileffelix’s comment, we may be looking at paint ball smacked on baldy’s head. What may have fooled me off hand was the fact that this story seems to silly or minor to fake. The blood isn’t there at the beginning, but after some bad panning appears later in copious amounts. The last fake story coming out of Peterborough I posted on was the silly plane “crash” down the main street. To compare and constrast with crisis acting /LARPers, we have what looks like a real event. Notice how real people behave. Occult #11 is the number of the story. 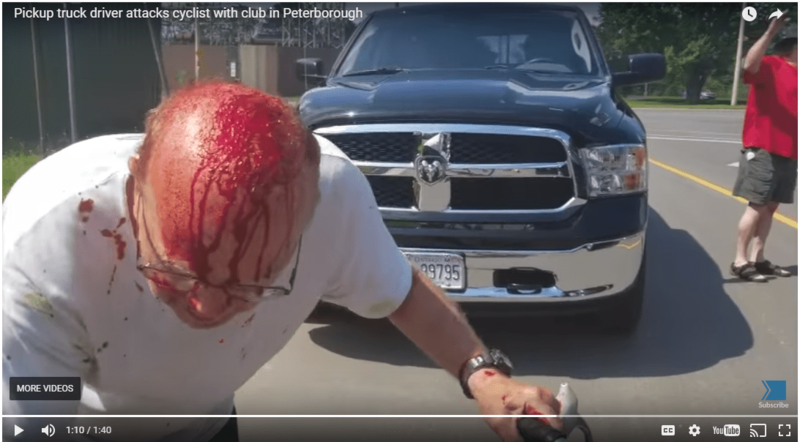 PETERBOROUGH—A driver has been charged after a dramatic video showed a 74-year-old cyclist viciously attacked on the side of the road with a club. Peterborough police said that just after 11 a.m. Tuesday, the cyclist was riding in the area of Erskine Ave. when an argument broke out between him and a truck driver. David Fox, 65, has been charged with aggravated assault and assault with a weapon. He was released from custody and scheduled to appear in court on Aug. 24. This entry was posted in #HRDPAR, Magic numbers, Suspicious media events on July 29, 2017 by ab. This entry was posted in Audio, Audiochats on July 29, 2017 by ab.